In order to really appreciate this Stardew Valley review and where it’s coming from, I think it’s best that you have a little bit of background information about me. I am approaching my thirties, I have a wonderful husband and an incredible toddler, a very busy full time job and a household to run. Whilst I have a lot of love for video games of all shapes and sizes, my time to play them is limited at best – normally restricted to after my little boy has gone to bed, if I can be arsed to move from my sofa. This makes what I’m about to describe all the more incredible. I heard about Stardew Valley very late in the game. Probably a good two or three months after it was released for the PC, to rave reviews, and it sounded like my thing. A very simple farming simulator, with a few key elements of growing crops, mining ore, cooking food, fishing and foraging. I’ve played RPGs before, this sort of thing seriously floats my boat. Add in the relationship aspect with a 30-strong cast of villagers, all of whom have very distinct personalities, quirks and backstories and I was completely sold. I desperately wanted to make a farm that worked and be loved by an entire village. Who wouldn’t? On my Mac however, I had serious issues with the gameplay. Probably in part before a mouse and keyboard, for me, is generally a pain to work with… I found the movement a bit clunky, switching between inventory and the main screen was hit or miss. Oh, and fishing? Forget it. It simply couldn’t be done. I gave it a couple of hours (no, really that was it) and I never picked it up again. Forgot about it entirely in fact. Until of course, it was announced as one of the games coming to the Nintendo Switch… and suddenly my interest piqued once again. This time was different. 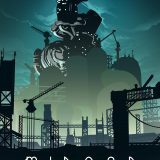 From the minute I began playing and for the first time in years, I found myself becoming almost consumed entirely by a video game. I would spend a decent chunk of my time at work researching tips, making honest-to-goodness notes about the gifts I should give each villager to maximise how much they liked me. It got to a point, where I had several quite in-depth discussions with my own husband about the pros and cons of the bachelors of the game and which one I would eventually decide to marry. This game prompted us to get another Nintendo Switch, for two reasons; the first is that I was hogging the console completely, from the minute our son went to bed, to the minute I fell asleep and the second was that husband now also wanted a farm of his own. The main one for me was its cast. There are an initial set of villagers who remain constant in this game, with twelve of them being eligible for your character to begin a relationship with and potentially marry and have children. Each one is clearly very different, with a well-crafted history which is presented beautifully to you as your relationship with each one increases. You will have your favourites for sure, but you’ll also surprise yourself with which of them you end up befriending first. For example, in my playthrough I ended up being very friendly with Jodi, who is a busy mother of two, whose husband is (for the first year at least) away with the military fighting a war. On first impression, I didn’t even really like the woman, but certainly grew to empathise with her a bit as our relationship expanded. Then she invited me over for dinner, and we were besties from then on. The Community Centre is another highlight and is the achievement hub of the village. 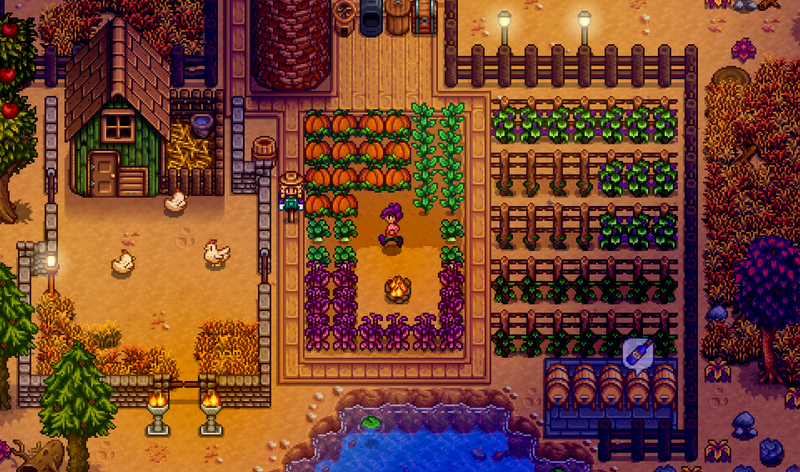 Stardew Valley gives you the option of how you want to play and you can either submit your own produce and crops in ‘bundles’ to unlock the spoils, or you can pay Joja Corporation to unlock the items for you. I opted for the first option, and got a serious sense of pride every time I unlocked something different. There’s also a travelling gypsy cart where you can buy the rarer items on the sly if you’re struggling! The music is beautiful, the setting is idyllic and you genuinely get the feeling that you’re becoming part of Pelican Town’s community and you’re building meaningful relationships. It’s a very simple game at its core and a lot of these additional features are optional, but you’d be missing out if you didn’t bother with it. You wouldn’t expect it to be when it’s developed by one person, but even now as it’s ported to the Switch there are still a couple of issues. My main bugbear at the minute annoys me most because it’s totally fixable. That’s this horrid crackling that you can hear on the Switch through the music. It is a known bug that that the time of writing hasn’t been patched. Another thing I’m not overly keen on is the combat aspect. It’s not difficult by any stretch but it is really awkward – it’s difficult to escape, it’s easy to end up facing the wrong way and overall, I end up trying to avoid it at all costs. Such is this issue, that I haven’t attempted certain later parts of the game because I can’t be arsed trying to navigate through the monsters. I end up losing more health than I think is fair in a lot of cases. The biggest disappointment, and the reason my game has tailed off pretty intensely just before the end of Year 2, is that the relationship system that kept me enthralled for so long, leaves you basically nowhere to go once you are married and have a child. There are about ten lines of dialogue that you share with your spouse, and sometimes they get a bit annoyed if you give gifts to other people, but there is no further deepening of the relationship with your spouse or your children, who don’t grow beyond toddlers. After working so hard to please everyone, it’s a pretty massive anti-climax. I would have appreciated some real incentive to be an awesome wife, or something more to work towards on the social side of things, but instead once you’re best friends with everyone, you don’t need to do anything else to stay revered. Don’t let that put you off. The journey is always more exciting that the destination and that’s just what this game is. 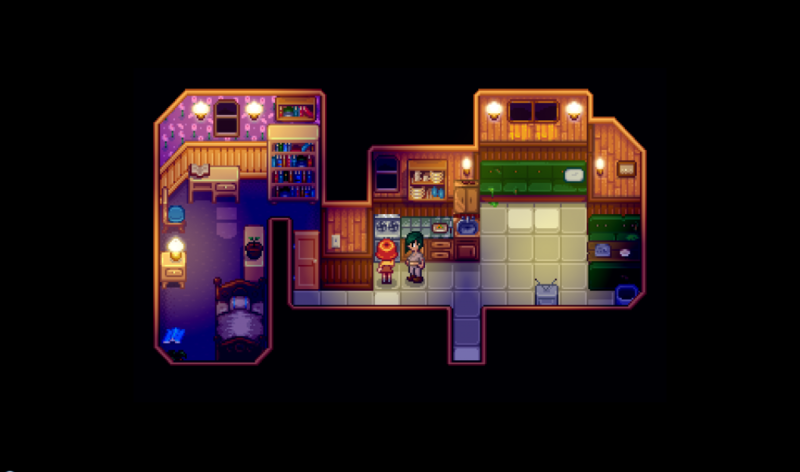 You will find yourself thinking about it when you’re not playing it – creating your farm and your little space to make it just how you want, naming your livestock and making sure they’re all happy and ultimately becoming a paragon of Pelican Town. If you’ve not gotten on board with the Nintendo Switch just yet, Stardew Valley is also available to to purchase on Amazon for PS4 and Xbox One and of course on Steam for PC and Mac.